I've been criticized in the past for attempting and succeeding in dining on Chinese food in the strangest of places (like Dim Sum in Orlando and Ft. Lauderdale). 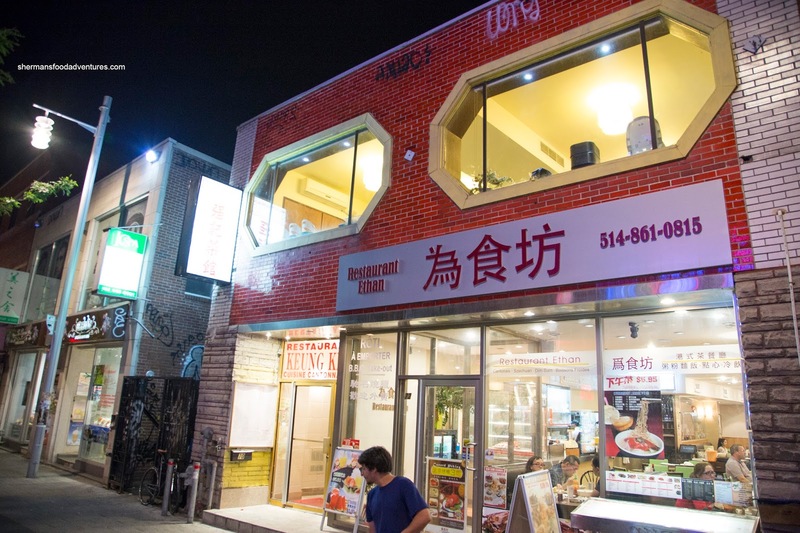 This is especially true since I'm from Vancouver, which sports some of the best Chinese food in the world. However, there are times I want to put that claim to the test and more importantly, I just need some comfort food to break up the monotony of eating the same stuff night-after-night. This was the case as we decided to eat a classic Cantonese dinner at Keung Kee in Montreal. 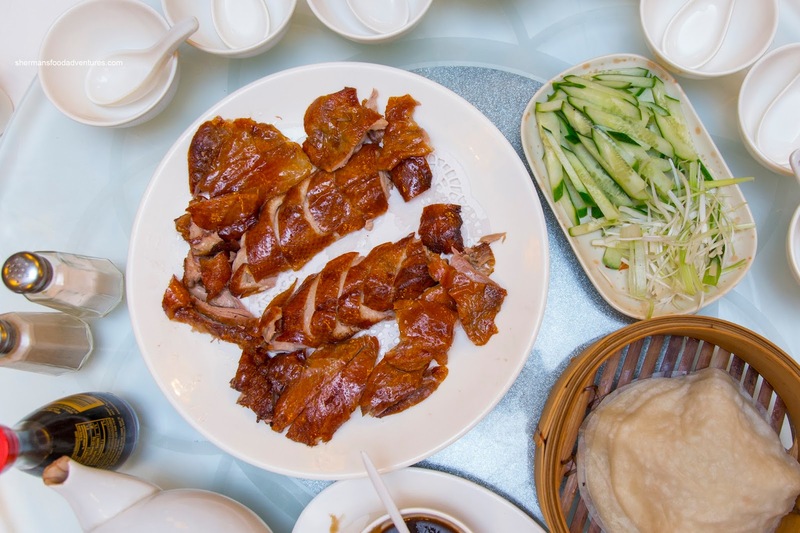 Since the kiddies were dying for some Peking Duck, we got the 3-course deal. It started with the requisite roasted skin with crepes and accompaniments. 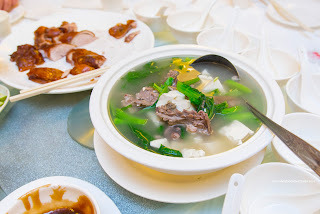 They served it in an almost Beijing-style with plenty of meat attached to the skin. There was a mix of crispy portions as well as softer pieces. I found that the fat was not well-rendered and/or it was the type of duck with a thicker layer of fat to begin with. I found the crepes to be fantastic as they were thin, slightly chewy and not dried out. For the second course, we got the Duck Bone Soup with mustard greens and tofu. Either we were homesick and wanted some Chinese soup or this was actually quite good. Whatever the case, it was balanced and flavourful with plenty of ingredients including a decent amount of meat on the bones. The third course was something unfamiliar to us as we normally we would expect a duck lettuce wrap. 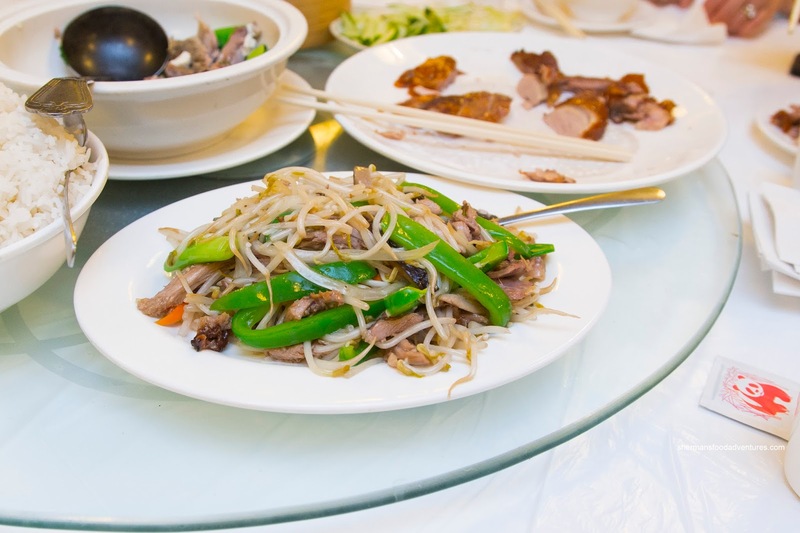 Rather, we got Stir-Fried Shredded Duck with bean sprouts and green peppers. Strange as it was to us, the dish was pretty good. There was a good amount of tender duck to go with the crunchy sprouts and peppers. The dish was well-seasoned, but due to the sprouts, the dish was water-logged. The same could be said about the Gai Lan with Beef as there was a considerable amount of moisture on the bottom of the plate. 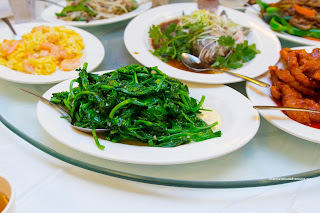 Despite this, the gai lan was crunchy, tender and vibrant. As for the beef slices, there was lots of it. The texture ranged from tender to a bit chewy. 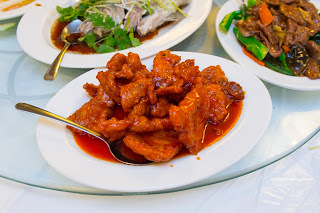 Much to the delight of Costanza's oldest son, we also had the Peking Pork Chops which are his fave. Although the colour was on the paler side, the sauce was nicely tangy and purposefully sweet. The viscosity was just right, but there could've been less sauce. The pork chops were plentiful and fairly tender with a meaty chew. I would've liked to see them more tenderized, but they were still fine. To my son's delight, we got the Shrimp and Eggs as he loves mixing it into white rice. He loved it so much, he must've had 4 bowls of rice. The dish was actually quite good with more shrimp than eggs. 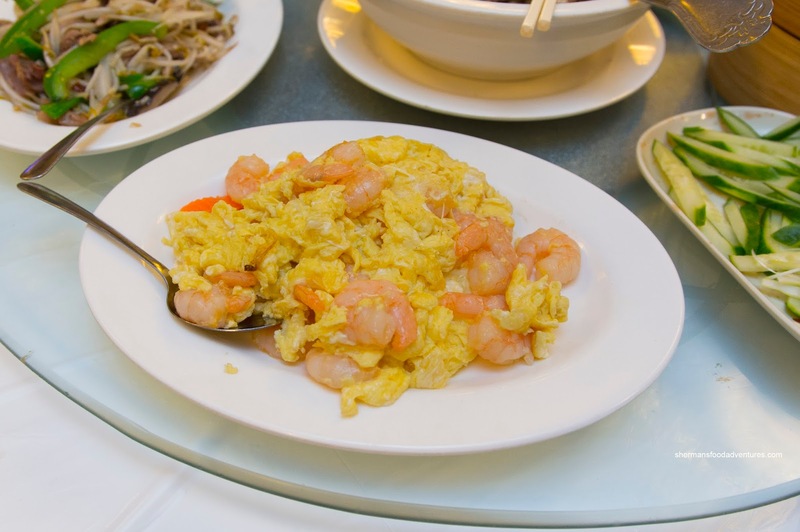 Large with a meaty snap, the shrimp were cooked just enough while the scrambled eggs were tender and fluffy. To go in a healthier direction, we also got a Steamed Whole Tilapia with green onions, ginger and cilantro. As much as I'm not a huge fan of the mushiness of tilapia in general, this one was prepared properly. 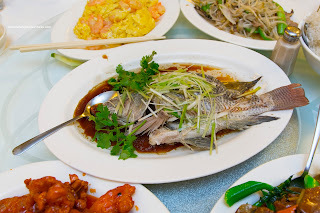 Not only was it fresh (it was a live fish), the meat was fairly flaky and buttery. The sweetened soy was balanced and not too salty. Our last dish was the Stir-Fried Pea Shoots with garlic (trying to get more greens into our diet). 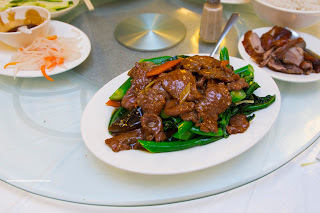 This was subjected to enough wok-heat where there was very little moisture while the pea shoots remained crunchy and vibrant. There was a good amount of garlic as well as seasoning. When we were done, it was pretty much agreed upon that the meal was solid. I'm pretty sure the fact we hadn't eaten a Chinese dinner in 3 weeks had something to do with it too.